It has been some time since we last looked at an example of post-war Canadian webbing. Collecting of these sets has slowed down a bit, but thanks to the generosity of Michel Auger from Canada, I am very pleased to have been able to add an example of the 51 pattern compass pouch to my little collection: The compass pouch is very closely based upon the earlier 37 pattern design from the UK, but made in the dark green of the 51 pattern set. 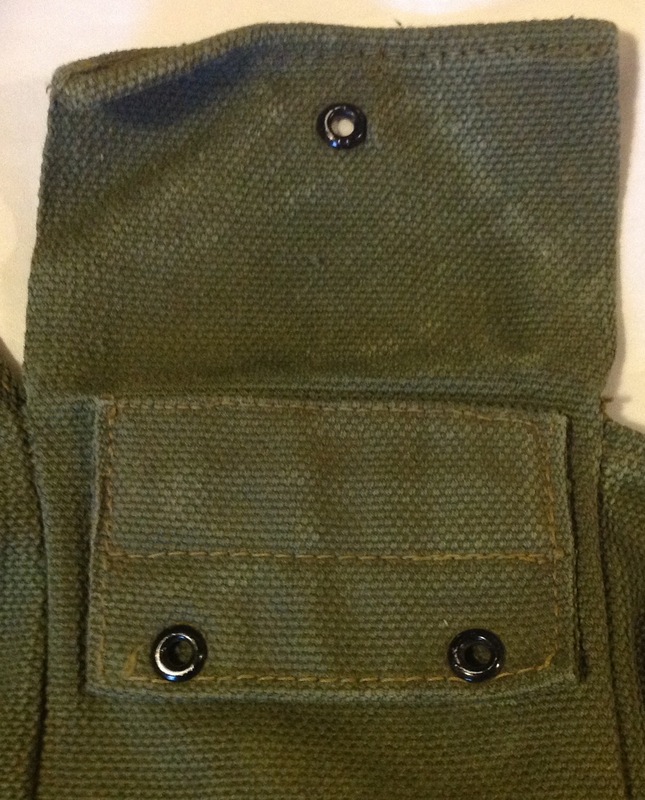 The rear of the case is very similar, but features simple webbing loops to pass a belt through, rather than the metal ‘C’ hooks of the 37 pattern set: This change in construction makes sense when you remember that the 51 pattern belt is very different in design to its predecessor and does not have the woven pockets on the rear for ‘c’ hooks to slot into. 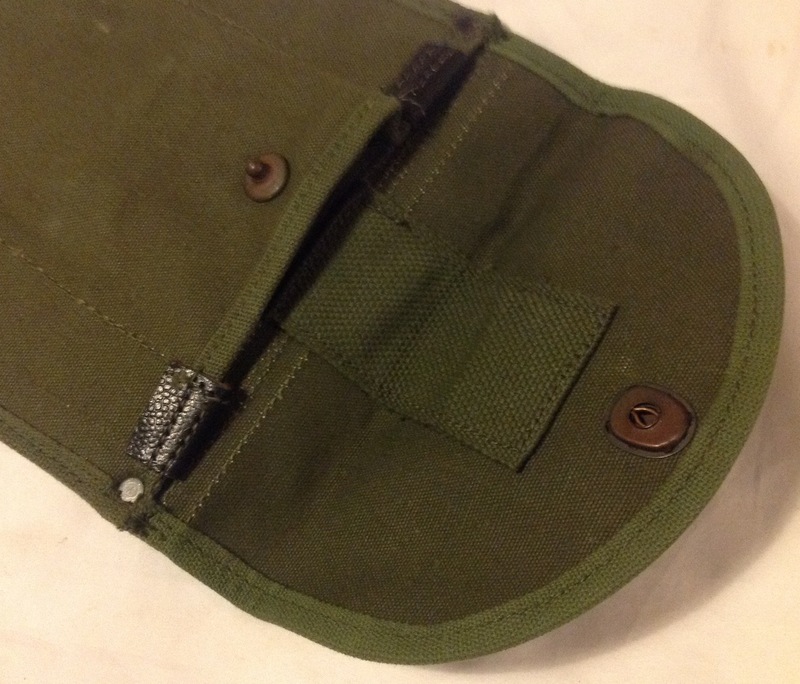 The front of the pouch has a box lid that is secured with a large blackened press stud: This opens to allow access to the compass which fits snuggly inside: Both the early prismatic and the later marching compasses can fit in easily. They are protected by a thick layer of reclaimed wool felt that surrounds the compass and offers some insulation from knocks and bumps: I am unsure of the technical term for this felt in Canada, but it is made of what is colloquially known as ‘mungo’ in my part of Yorkshire. This is a poor quality fabric made from the torn up rags and cloth that is pressed or sometimes woven into a cheap cloth. The underside of the box lid is stamped with the date of manufacture ‘1953’: Note also the circular acceptance mark stamped here. I have finally found some information out about this mark. It consists of a stylised leaf in a circle with the letters ‘IS’ for ‘Inspection Services’ and was stamped on the webbing to indicate that it met the requirements for military service. It has been nice to add another piece to my Canadian collection, which had rather stalled of late. It has given me a little incentive to try and track down a few more components. This entry was posted in 51-Webbing, Canada, Post WW2, Webbing on April 27, 2018 by hatchfive. This entry was posted in 51-Webbing, Canada, Post WW2, Webbing on July 11, 2017 by hatchfive. As we have discussed before, the Canadian 51 pattern webbing set drew heavily on earlier British and American load bearing equipment designs. The 51 pattern set used ‘L straps’ to secure the large and small packs to the rest of the webbing and these were a close copy of the British design Mills had used on the 19, 25 and 37 pattern sets. Here the ‘L strap’ is made of a dark green pre-shrunk cotton webbing and the brass fittings are chemically blackened: The L-Straps attach to the large pack using two-inch Twigg buckles in the same manner as 37 pattern webbing sets to fasten to the webbing tabs on the top of the pack. 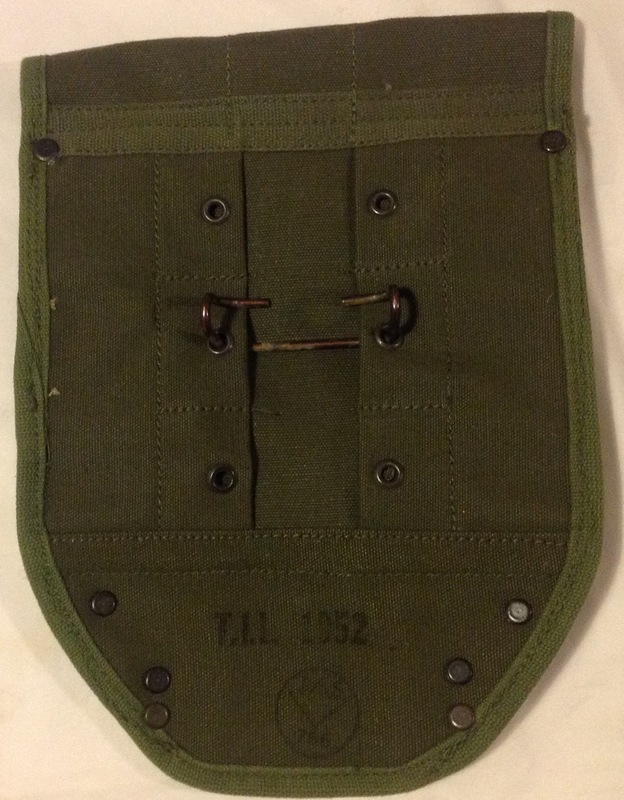 One obvious thing to note though is that the 51 pattern ‘L strap’ uses a single piece of two inch webbing and attaches to the tops of the ammunition pouches with a 2” hook rather than the 1” hook seen on the earlier British designs: Not only does this make the ‘L Strap’ easier to manufacture, it also increases the load bearing area making the connection stronger and easier to manipulate by the wearer. The ends of the tabs have brass chapes to prevent fraying, again blackened: Faint manufacturer’s markings and dates can be seen on the webbing, but as with much of this pattern they are faint and often hard to read: I think the date here is 1951, but I could be mistaken. As with the rest of the set, it is interesting to see how the Canadians have taken a British design and modified and improved it to meet their own needs. This entry was posted in 51-Webbing, Canada, equipment, Post WW2, Webbing on June 13, 2017 by hatchfive. This entry was posted in 51-Webbing, Canada, equipment, Post WW2, Webbing on March 21, 2017 by hatchfive. In our continuing study of Canadian post war webbing we turn to the 51 pattern large pack tonight. 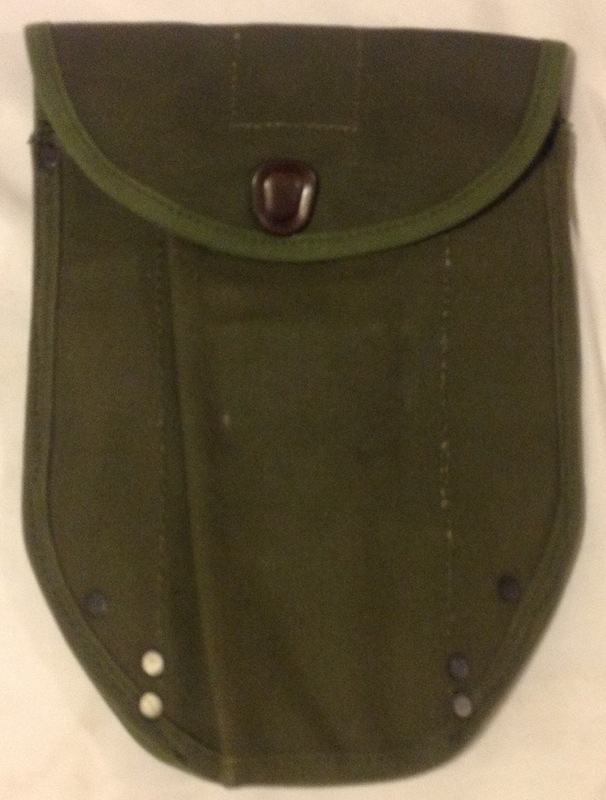 This pack was designed to fill the same role as the large pack in the old 37 pattern equipment- to carry the soldier’s extra kit during transit rather than for use in the field. The design is clearly closely based off the old 08 pattern large pack we looked at here, but it has some uniquely Canadian features added to the basic design: The basic pack has been modified by adding a webbing flap with two eyelets to the top flap to allow wire hangers for items such as the entrenching tool cover to be attached: A second flap with the same eyelets is provided on one side of the pack, I suspect this was for the machete to be attached: Notice above there is another small eyelet on the top flap of the pouch, this was carried across from the earlier design and allows a piece of string to be used to help tighten the top flaps across. 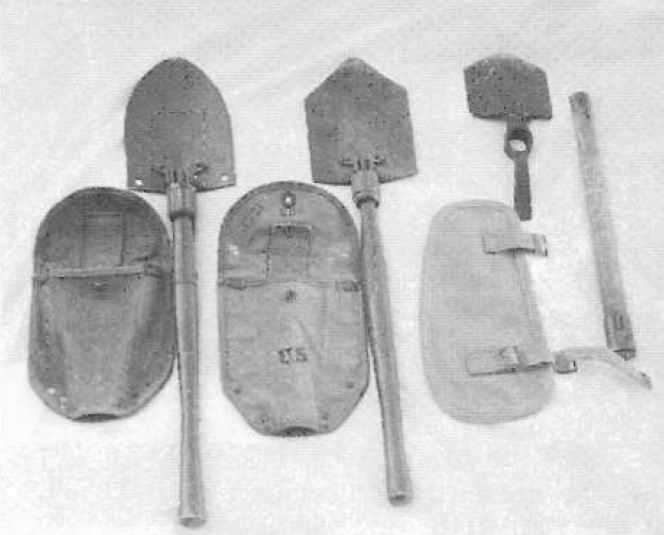 Other features carried across from the earlier design include the use of 1” Twigg buckle and strap to secure the main top flap: As with the rest of the 51 pattern set the brass fittings were orignally chemically blackened, as can be seen here on the ends of the straps this did not always wear well. 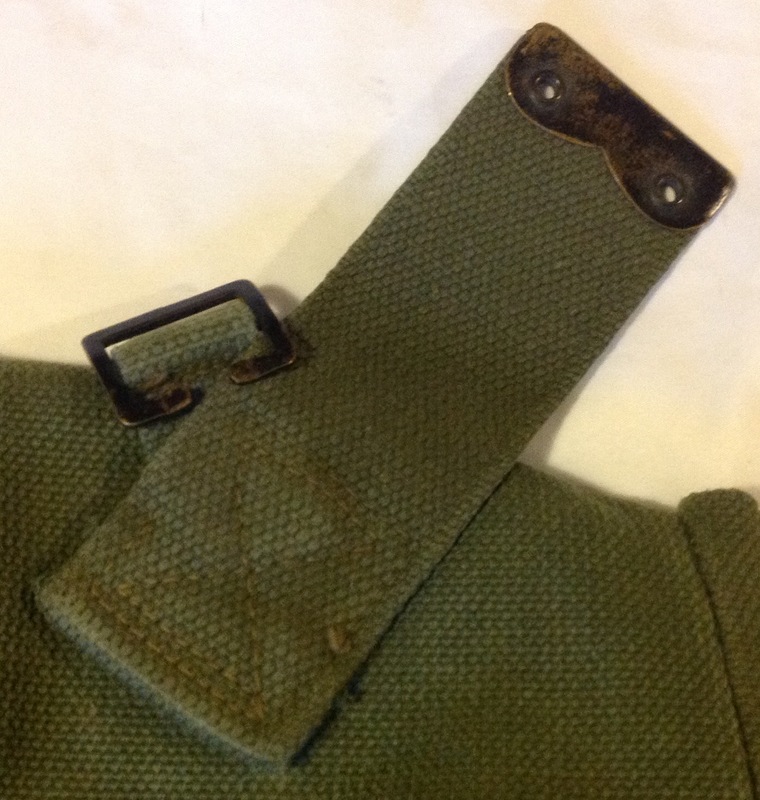 The same strap and buckle arrangement at the top of the flap to attach the L-Straps to as the 08/37 Pattern Large Pack was carried across to the new design: It does seem odd that this pack even exists- the 08/37 pattern large pack was viewed as being entirely unfit for purpose by the end of the Second World War- it wasn’t big enough, was uncomfortable to wear and was not sufficiently adaptable to the changing needs of a modern soldier. 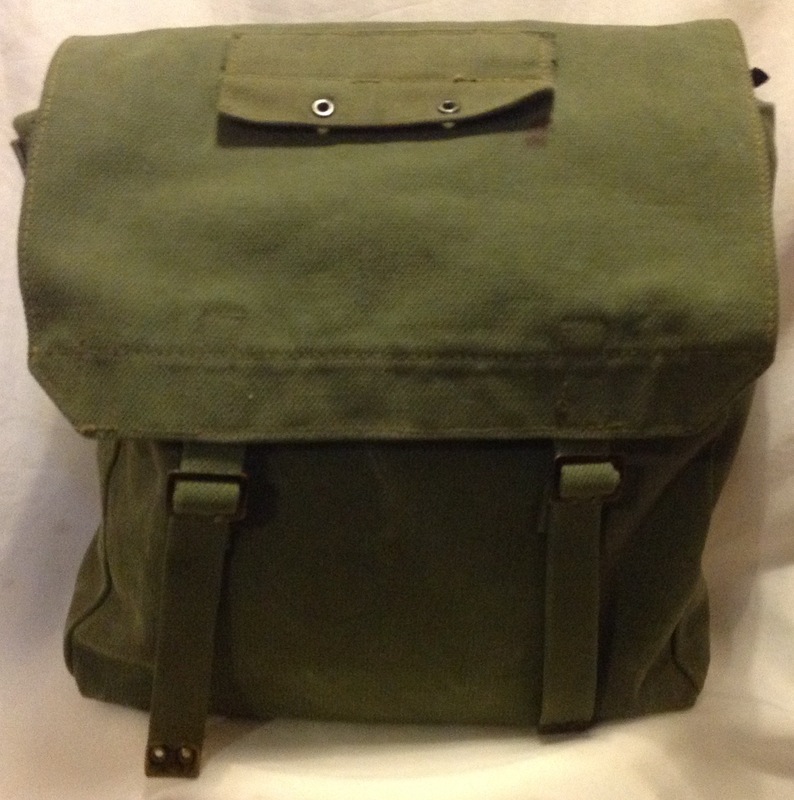 However it was cheap to produce compared to more flexible and useful framed rucksacks and in a time of post war austerity the large pack continued to be made and used in both Britain and Canada. This entry was posted in 51-Webbing, Canada, Post WW2, Webbing on January 31, 2017 by hatchfive.